Welcome back to Ready. Set. WRITE! If you’re wondering what RSW is all about, it’s a summer long writing intensive with the purpose of writing, revising, planning, and keeping each other accountable. We will be sharing our goals on Mondays, keeping our posts BRIEF (2-3 lines per heading) so we can spend more time on writing and less time on blogging. You can sign up at any of the host blogs (Alison‘s,Katy‘s, Erin‘s, Jaime’s) every Monday. And don’t forget to hop around to encourage other participants. For more info about RSW and a link to their super fun buttons, go here. Not so great. Actually, hmm, not so great at all. Clearly, I need to get typing. * Write 5000 words of ONLY ONE DREAM – the prequel novella of One, Two, Three. Making the time to write. I’ve been very busy at work and with some other things. It’s awesome that RSW exists! I may just have to sign up for it. You have some ambitious goals–best of luck reaching them :). Finding time to write really is hard, but I’d bet the accountability really does help. Love that there’s going to be a prequel for One Two Three!! Good luck on the 5K and revising!! Can’t wait for DLG! More time with Nata! LOVE IT!!! And whenever you need eyes on anything, feel free to send my way! Good luck with the writing this week, Elodie! You can do it! The way you feel about Natalya is how I feel about my character from my current WIP. She’s like an old friend or a favorite cousin. I love the line you shared, Elodie! I’m writing a companion for a novel that’s already done, and I know what you mean about how nice it is to already know the characters. Makes drafting a little less painful. Best of luck with your goals this week, friend! Making time to write is a challenge. Especially when you’re stress out about writing, it’s the last thing you want to do. You can do it. We believe in you. 😀 Thanks for sharing. I like the line you shared, Elodie! It will be wonderful to see Nata pre-ONE TWO THREE. I’m guessing there will be lots of ballet goodness??? 🙂 I hope things slow down a teensy bit for you so you can squeeze in some writing this week. I know how much you like spending time with Nata. Have a great week! Good luck with your prequel! I’m eventually going to write two prequels to my Russian historicals, and really looking forward to getting to know my characters’ parents as children and young adults, and to be with my characters as children again. I like the line, Elodie! I know what you mean about being busy from many quarters of life. That’s what it has been like for me these past two weeks. Here’s hoping things calm down for us both. Good luck with your goals this week! I love the line you shared! Sounds like we had similar weeks last week. Here’s hoping for lots and lots of words for the both of us in the coming week! Can’t wait to hear more about your novella! I imagine novella writing must be very different from novel writing. We all have those weeks! But I have no doubt you’ll reach your goals this week. I love the line you shared. That’s awesome that you know your character so well. That always helps with the writing process. Also, writing a novella sounds like a lot of fun. I haven’t read One Two Three yet, but I love the line from your prequel, it’s beautiful even in ‘rough’ form. Hope you’re able to get some work done this week. Getting into a writing funk is normal, just keep going! I love your excerpt. Good luck with your revision and words this week! You can do it! 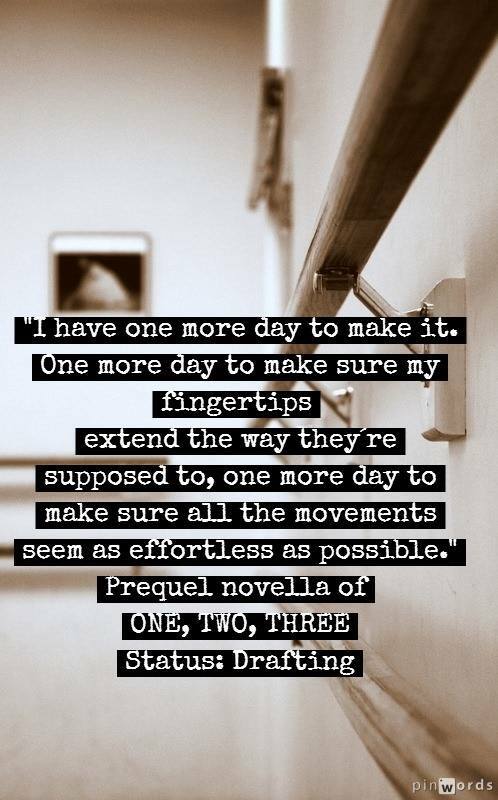 AH, I’m a sucker for someone running out of time – I love that “one more day left’ element. Love the name Natalya too. Hope your fingers are stretching to the keyboard to meet your goals!